Town in the government of Siedlce, Russian Poland; near Warsaw. It has (1904) a population of 13,681, of whom 9,000 are Jews. The first Jewish settlement dates probably from the sixteenth century, its members coming from Germany and especially from Frankfort-on-the-Main. The Jews control all the business of the town. The making of bristles for the German export trade, via Leipsic, is one of its important industries, in which many Jewish workmen are employed. Moses Michel Migdal introduced this enterprise. The synagogue, a very imposing stone structure, with a seating capacity of approximately 3,000, was built about 1800; Count Potocki, who formerly owned the town, is said to have contributed a large sum toward its erection. The bet ha-midrash was built in 1859. Miedzyrzecz has several minor congregations, a Talmud Torah, and a yeshibah (founded by Bendet Barg; d. 1891). Many Jews from Miedzyrzecz settled in the Holy Land, among them being Ẓebi Hirsch Fischbein (d. Jerusalem 1870) and David Janower. Both contributed to the founding of a Talmud Torah in Jerusalem. The colonists of Yesod ha-Ma'alah, near Safed, in 1885, were all from Miedzyrzecz. The following is a list of the rabbis of Miedzyrzecz; Ẓebi Hirsch b. Abbusch of Frankfort-on-the-Main (d. 1734); Isaac b. Ẓebi Hirsch (d. 1771); Löb of Frankfort; Naḥman b. Elijah; Ephraim Eliezer Ẓebi b. Ẓeeb Harlap (Eliezer Harlap; d. 1849; a descendant of Gedaliah ibn Yaḥya; he was a cabalist and left many manuscripts, some of which have been published under the title "Migdenot Eliezer"; in its introduction he traces his descent from King David); Yom-Ṭob Lippe Heilpern (author of "'Oneg Yom-Ṭob," responsa); Joshua Löb Diskin (d. Jerusalem 1898); Simḥah Samuel (author of "Mesharet Mosheh," novellæ on Maimonides' "Yad"; d. 1865); Israel Isser Shapiro of Augustow (d. 1895); Naḥman Baer Shapiro (son of Israel Isser). Miedzyrzecz has had several authors of note. 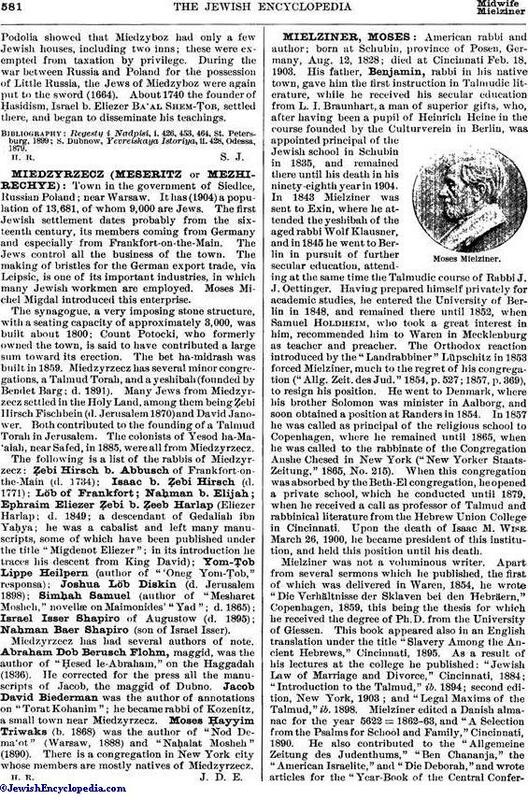 Abraham Dob Berusch Flohm, maggid, was the author of "Ḥesed le-Abraham," on the Haggadah (1836). He corrected for the press all the manuscripts of Jacob, the maggid of Dubno. Jacob David Biederman was the author of annotations on "Torat Kohanim"; he became rabbi of Kozenitz, a small town near Miedzyrzecz. Moses Ḥayyim Triwaks (b. 1868) was the author of "Nod Dema'ot" (Warsaw, 1888) and "Naḥalat Mosheh" (1890). There is a congregation in New York city whose members are mostly natives of Miedzyrzecz.